The conditions aboard the stricken Costa Allegra have been revealed by passengers who have finally disembarked from the liner in the Seychelles. One of the vessel's 31 British passengers told the BBC that the toilets had "packed up" and were becoming increasingly unpleasant as the vessel was towed to port. Derek Adams added that without electricity - knocked out by the hour long fire which broke out on Monday - the ship had been left with no lights or air conditioning to compound the lack of sanitation. The disastrous cruise comes as a sharp reminder to holidaymakers to make certain they have a cruise travel insurance policy in place before embarking. 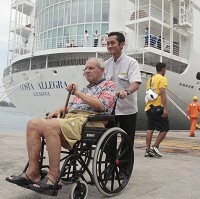 The ship was towed to the Seychelles carrying 627 passengers who also had to cope with a diet of a bread and salami. They were met on land by travel agents, the Red Cross and Seychelles island officials. The vessel is part of the same fleet, Costa Cruises, as the Costa Concordia on which 32 lives were lost after it struck rocks and turned on its side off the west coast of Italy in January.